(On DVD, March 2011) Don’t go near this film unless you’re ready for a concentrated dose of seething rage. 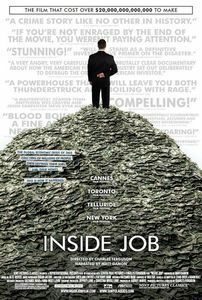 A thorough and intelligent exploration of the causes of the 2008 financial crisis, Charles Ferguson’s Inside Job steers clear of MichaelMoorish grandstanding and keeps an even tone throughout, but it’s this reasonable delivery that allows viewers to be outraged on their own cognition. Directed with surprisingly high visual ambitions for a talking-head documentary (the opening credits alone, featuring aerial photography of New York, are very impressive), Inside Job works hard at making a complex subject accessible, and succeeds through the usual mixture of info-graphics, interviews, voice-over narration (from Matt Damon) and a tightly-constructed script. Following No End in Sight, Ferguson confirms how adept he is at presenting public-policy issues in an accessible format. Keep up with the dense accumulation of facts, and you will learn something about the way the financial industry has managed to escape regulation and avoid any effective policing of its actions… with consequences for the rest of us. Spanning the globe, Inside Job draws clear connections between the obnoxious cowboy mentality of the financial class and the repeated crises that they engineer through shared greed. It’s also clear that the US political system has been systematically corrupted by its influence –especially when other government prove more adept at responding to the situation. Unfortunately, Ferguson isn’t able to offer much in terms of comfort: the picture comes closest to accountability when, challenged by a defensive Glenn Hubbard to “Give it your best shot”, it brings down a damning accumulation of conflict-of-interest charges against an academic seduced by money and political power. It’s only a small illustration of the collusion between finance, government and academia (Even disgraced ex-prosecutor Elliot Spitzer has a poignantly ironic moment in reflecting on how the personal flaws of finance workers haven’t been used to get them to turn state’s evidence), and viewers shouldn’t feel surprised if they feel as if something has to be done in order to avoid another crisis. The DVD contains engaging supplemental material, describing how to make an ambitious global documentary on a small budget, and what goes into tightening hours and hours of footage in a finished product. This is one documentary DVD that has the intellectual heft of a good book: don’t miss it.